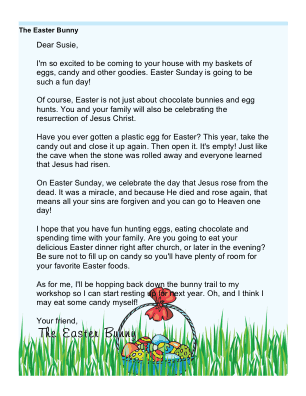 A printable letter from the Easter Bunny to a Christian child whose Easter plans include church services and celebrating the resurrection of Christ. I'm so excited to be coming to your house with my baskets of eggs, candy and other goodies. Easter Sunday is going to be such a fun day! 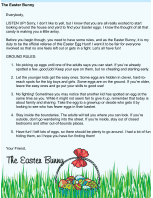 Of course, Easter is not just about chocolate bunnies and egg hunts. You and your family will also be celebrating the resurrection of Jesus Christ. Have you ever gotten a plastic egg for Easter? This year, take the candy out and close it up again. Then open it. It's empty! Just like the cave when the stone was rolled away and everyone learned that Jesus had risen. On Easter Sunday, we celebrate the day that Jesus rose from the dead. It was a miracle, and because He died and rose again, that means all your sins are forgiven and you can go to Heaven one day! 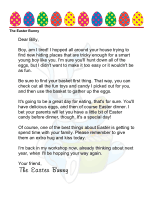 I hope that you have fun hunting eggs, eating chocolate and spending time with your family. Are you going to eat your delicious Easter dinner right after church, or later in the evening? Be sure not to fill up on candy so you'll have plenty of room for your favorite Easter foods. As for me, I'll be hopping back down the bunny trail to my workshop so I can start resting up for next year. Oh, and I think I may eat some candy myself!